How is it already just about half way through the year!? I can't even with how fast 2017 is FLYING by. It feels like I just shared my first round of Chicago museum free days. Well it's time for a little update. 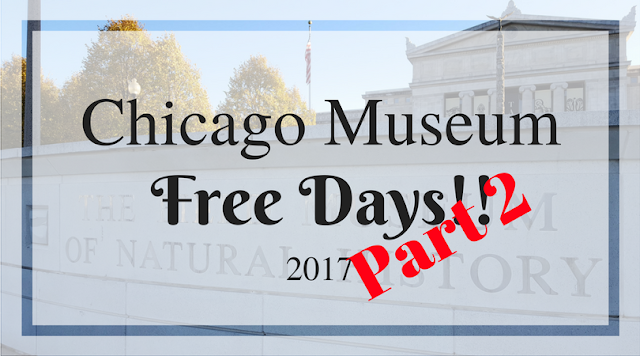 There are some museums that need to be updated as they update their free days throughout the year. There are also usually discounts for certain groups, such as military personnel and teachers. Be sure to check websites or call and check to see if you can get that discount before you go. If you're not far from the Chicago area I would also highly recommend you become a member of your favorite museums you visit often. This not only gets you into the museum for a discounted rate and in most cases special member perks but it supports the museum and the work that they do. There really is no better deal that becoming a member! !